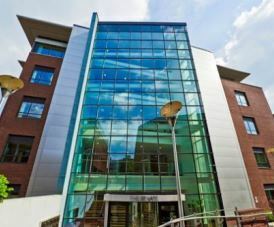 Southernhay Gardens serviced offices has been re-modernised throughout and offers a blend of small to large suites for let. Situated in the centre of Exeter, local amenities are plentiful with various shopping outlets, restaurants, and cafes in the area. Transports facilities close by include two main train stations and for commuters by road, there is a car park at the site. There is a large reception at the entrance of the building that is staffed and can greet or meet guests that visit the Business Centre. Meeting and boardroom hire is available at the location and can be used, prior to booking, for general company meetings or even training sessions. For a hassle free office space that provides all the necessities to run a business, this option is perfect, as there is broadband and phone lines set up in every suite as well as furniture for employees. Suites are also cleaned on a regular basis.